That yellow dress is certainly a far cry of that smashing white dress of the day before. From a Yahoo Group. Don´t know where they got it from. shock". The creators were happy with all the fuss. something you have to expect when you dress up public figures,"
when she is satisfied, we are satisfied," Grasmo said. 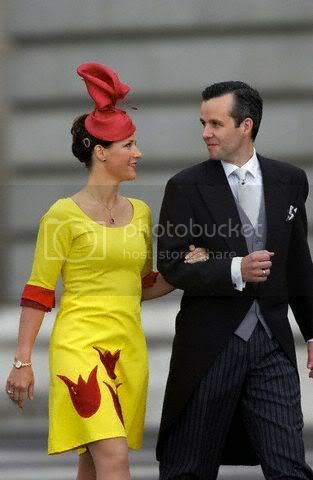 wedding in Spain, but didn&#39;t know at which occasion it would be worn. i just hated her dress and hat ...my god she used to have a good taste for dresses ...what happened to her &#33;&#33;?? I don&#39;t know... maybe the dress would&#39;ve been better had it been red instead of yellow, and the embroidery yellow? It&#39;s an okay dress, but it&#39;s not suitable for the occasion. did she cut her hair again?? or did she wear extensions at the weddings? I think they were extensions. Just before that her hair was the same height it is now. Hair extensions .... what are those? Ask, and yee shall receive. Thank you, Dennism and Kirstengrafin. Quick question - has Martha&#39;s dropping of the HRH really made any difference? It seemed like she was trying to back away from royal duties a bit when Harald got sick. But now that he is back she still seems to be around alot. Any other reason she dropped the HRH? Also, can Ari be given a title, or order in Norway? It always seems that he is more left out that husbands of other Princesses in Europe. Princess Märtha did indeed indicate that one of the reasons she dropped the HRH was because she wanted to cut down on her engagements. However, the illness of King Harald proved (at least to me) that she is still needed. He is now back in business, but the Crown Princess is still taking care of her young daughter, which is probably one of the reasons Princess Märtha has quite a few engagements also this month. Personally, I don&#39;t think dropping the HRH title made any difference, and it wasn&#39;t such a good idea. People still treat her as a Princess, and she is still needed to perform royal engagements. The Princess will have another tour of reading fairytales in September, and will together with her husband move to New York this autumn. Obviously this means she will not perform many engagements. The Norwegian constitution clearly states that no citizens can have titles, except those in line for the throne. Thus King Harald could give a title to Maud Angelica, but not to her father. Regarding Orders - Ari Behn is not likely to receive any Norwegian ones, as he does not do anything to deserve them. His position is the same as Princess Astrid&#39;s husband Johan Martin Ferner, and he has not received any Norwegian Order. However it is very likely that Ari will receive orders from foreign countries if he is present during state visits. Especially visiting monarch might give him orders. Ari has designed a set of china for Magnor Glassverk. According to himself this is something he has been wanting to do for ten years. He has been working on this for the past two years, after being approached for the company. Personally I think the design looks very interesting, but I don't know if it is something I would want to eat off - it looks more like something you keep around for decoration. Well done Ari Behn, they certainly are a beautiful china setting. I think they would look wonderful in a modern house. The glasses however are something I would deifinitely love to have.